When one hears of an anime being created from a manga or novel series the source material is almost always still being published in some form. Only rarely, outside of visual novels, do series receive an anime adaptation after being completed but Parasyte is outside the norm. Originally published through the late 80s and early 90s, the Parasyte manga wrapped up in 1995 and two decades later Parasyte -the maxim- anime adaptation was released. 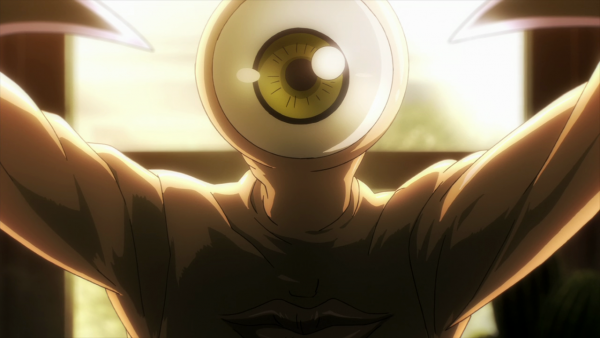 Now that Sentai Filmworks has released the first part of Parasyte -the maxim- in the West, is the series worth picking up? Third year high school student Shinichi Izumi wakes up one night after having a terrifying dream that a strange wormlike being had managed to crawl into his arm. After his parents chalk it up to him simply having a nightmare and accidentally tying his earphone cord around his arm, he continues on like nothing has happened. That is until he encounters a child about to be run over by a car in the middle of the road and attempts to save her. Rather than simply knocking her out of the way however, his right hand manages to stop the car dead in its tracks. To make matters worse it also has grown an eyeball and is staring at him. Shocked as one would expect to be, Shinichi returns home and attempts to rid himself of the creature by stabbing it but after it not only defends itself but begins talking, he learns that he is in a far worse situation than he could imagine. The creature has taken over his right arm after “failing” in its objective to reach his brain and take control of his body. After realizing that he cannot go to the police or even the hospital, Shinichi names the being in his right arm Migi and resigns himself to living with the parasitic being. It isn’t long before Migi realizes that more of his kind are within the vicinity and while Migi might have failed in its objective, other of its kind have succeeded and grisly murder scenes begin popping up around the world as family members of people taken over by these parasites have become food for the creatures. An effort to learn more about Migi’s origins results in a conflict and a realization that almost every other creature infected by these flesh-eating monsters sees Shinichi and Migi’s pairing as not only a failure and a dangerous threat, but also as food. This creates a dynamic where Migi often detects others of its kind in an area and Shinichi either pursuing the creature or finding a secluded place where he can keep his secret safe during a confrontation. Much of the first twelve episode of this season consist of these types of confrontations and Shinichi and Migi learning to cooperate with one another in order to survive. Things are changed up here and there thanks to a few infested hosts they encounter seeing them as something more than an enemy and more like an experiment of sorts. The other aspect that develops over the course of this first half relies upon how Shinichi perceives himself as being human and different from Migi, whose cold and calculating thoughts are often seen as horrific by his human host. Throughout the series we see Shinichi go from actively resisting Migi’s suggestions to slowly losing elements of his human nature as he loses the ability to cry and even begins to act cold and rational in a manner that scares those who knew him before. Spread throughout this first half we see small arcs develop and while the initial few are small and serve as a way to demonstrate just how vital Migi’s continued existence and combat prowess is to keeping Shinichi alive, a few longer arcs develop in the latter half. These storylines are a bit mixed, with one involving Shinichi’s own family serving as an incredibly emotional series of events that peter out a bit in the middle before coming to a conclusion while another brings the danger incredibly close to home as his school becomes host to a seemingly friendly but unwelcome parasite. It is also worth noting that there are elements of a love triangle worked into the series as Shinichi’ longtime crush on his friend Maruno begins to flourish while another girl named Kana with the ability to sense the infected believes Shinichi is her soulmate. These interactions are a bit messy at times but thanks to the way things are handled and the fact that Shinichi is trying to keep them safe while also protecting his secret helps play into these scenes, helping give the interactions something of an organic feel even if such a love triangle does feel a bit forced. Regardless, the character interactions with those close to Shinichi as well as his dealings with other members of Migi’s kind help portray an incredibly interesting storyline that is filled with drama and horrific events that will keep you watching all the way through until the last episode leaves you anxious for the second half to be released. 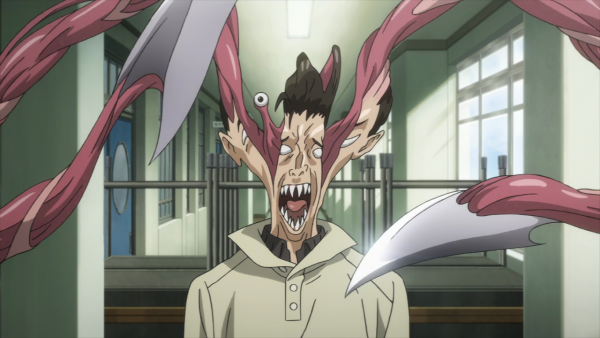 Considering the abilities of the parasites in Parasyte -the maxim- can be compared to something such as John Carpenter’s The Thing, with the way that they infect a host and then can transform various parts of their hosts body into weaponry or monstrous mouths for feeding on prey I must say that there is quite a bit of restraint shown here. More often than not the horror aspect of the series comes from what is briefly shown with the results appearing later in shadows and rarely does the animation choose to bask in the blood and gore. Instead the horrific looking transformations of these once human creatures and the reactions they receive serve as some of the best visual moments of the series. Oddly enough, despite the fact that these creatures can assume various weapon forms, almost every fight breaks down into a flurry of bladed tentacles whipping around at blinding speed. This is a disappointing shortcut since the build-up to these confrontations are handled in expert fashion thanks to Migi’s ability to determine how close a foe is and the often personal nature of the conflict. 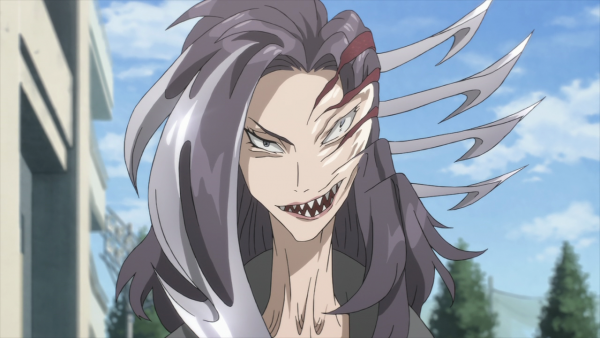 With the release of Parasyte -the maxim- in the West Sentai Filmworks has opted to give the series an English dub to go along with the original Japanese voice track. The English cast does a nice job with the voice work here with Brittney Karbowksi handling Migi’s alien sounding voice exceptionally well though a few side characters do sound a bit off from time to time during dramatic scenes. The soundtrack for the series is something of a mixed bag. There are many I believe that will not like the fact that the most common background music is a dubstep track that is played during action sequences but considering it feels fresh, I happened to enjoy it. As for the opening and closing themes, the opening track is “Let me Hear” by Fear, and Loathing in Las Vegas and serves as an incredible opening for these series while “It’s the Right Time” by Daichi Miura slows things down with emotional lyrics that is either a complete about-face from the tone of an episode’s last few minutes or makes for an incredibly poignant moment depending on the episode. 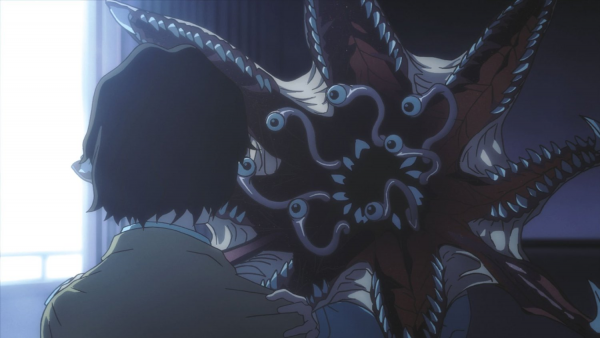 The bonus features included in Parasyte -the maxim- Collection 1’s Blu-ray release are fairly standard for Sentai Filmworks as the company has included a clean opening animation, clean closing animation, and trailers for other series they are releasing. 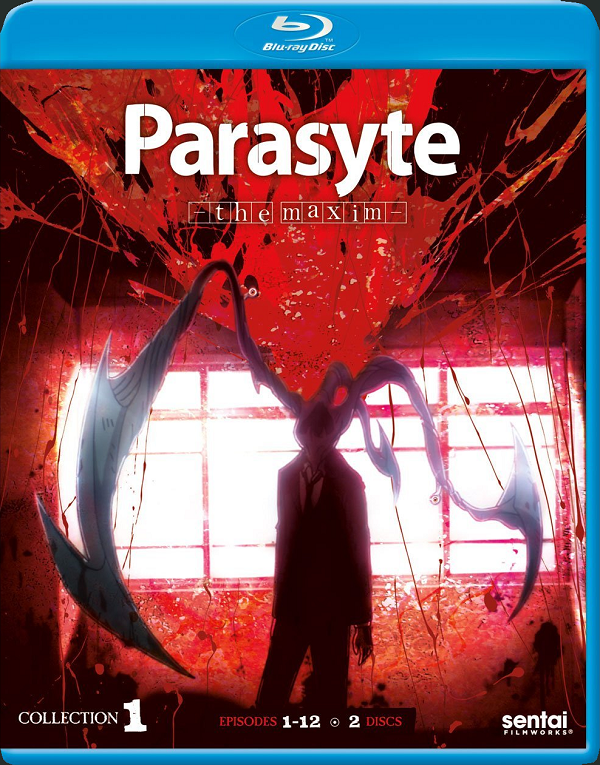 Parasyte -the maxim- Collection 1 lays down a solid and satisfying foundation by quickly introducing viewers to just how terrible things can become thanks to the cannibalistic creatures that have disguised themselves as humans in the world. 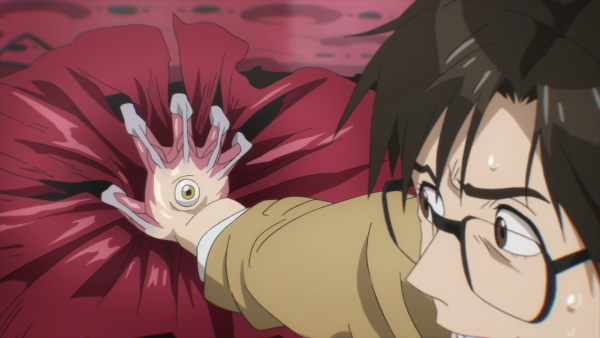 Watching Shinichi’s personality slowly change as he works with Migi to stay alive and attempt to protect those close to him makes for an engaging experience that viewers will be eager to see continue in the second half of the series, especially since so many threats remain lingering in the shadows while others are coming to the forefront.